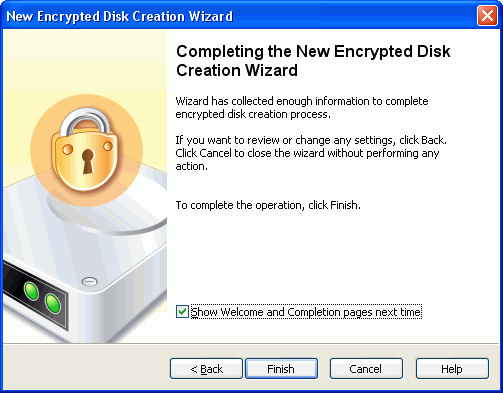 1 Double-click the R-Crypto icon in the system tray and select Run new encrypted disk creation wizard on R-Crypto management panel . • Right-click the R-Crypto tray icon and select Create New Disk on the shortcut menu. • In the Windows Explorer, go a place where are you going to store the file container for the encrypted disk, right-click there, select New , and select R-Crypto file container on the shortcut menu. You may make R-Crypto not to show the first and the last panels in the wizard. Clear Show Welcome and Completion pages next time . 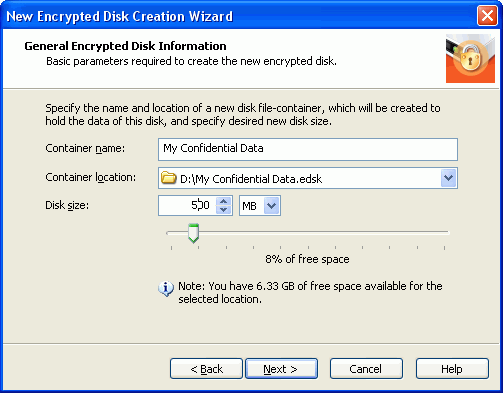 2 Specify the name and location of a file-container for the disk, and its size on the General Encrypted Disk Information panel and click the Next button. Container name Specify the name of the file-container. That should be only the file name without a drive letter and path. Container location: Specify the path to the file-container. You may enter the location directly, select a location, or select <Browse> to browse to the required place. Disk size: Specify the size of the file-container. You may also use the slider to select the size of the file container. If needed, you may change the disk size later. You may select the settings either from a predefined set, or select them separately on the Encryption Settings dialog box. 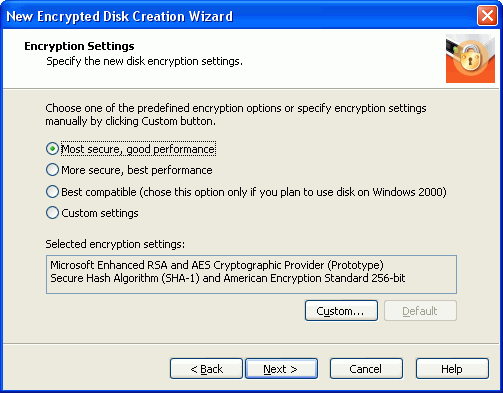 Select custom settings to reach the Encryption Settings dialog box. The Selected encryption settings field briefly describes the settings you have selected. 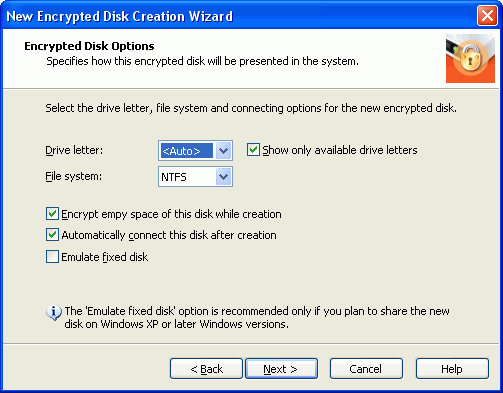 Please note that you need to select Best compatible if you plan to use the encrypted disk on Windows 2000. You may learn more about the encryption and hash algorithms on the Cryptographic and Hash Settings topic. Drive letter: Select the drive letter under which the connected encrypted disk will be visible to your system. Select <Auto> to let R-Crypto select the drive letter itself. Show only available drive letter: If this check box is selected, let R-Crypto shows only drive letter available for the connection. 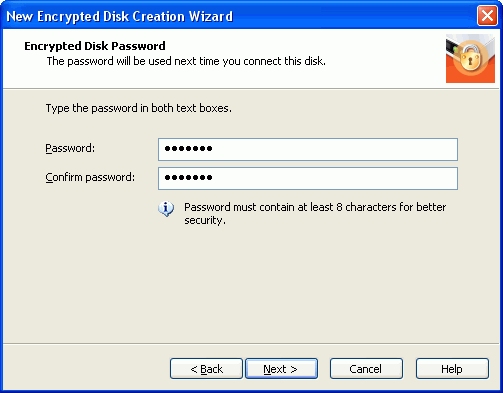 It is impossible to connect an encrypted disk using the letter that is occupied by another device in the system. Encrypt empty space of the disk while creating: Select this check box if your want R-Crypto to encrypt the empty space in the disk's file container. This option increases time necessary to create a disk but also increases security as it conceals the size of the encrypted disk' s file-container occupied by actual data. Emulate fixed disk: Select this checkbox if you want your system see the disk as a fixed one. Select Emulate fixed disk only if you plan to share the new disk on Windows XP or later Windows versions. Go to the Best Security Practices topic for more information on how to choose a strong password. 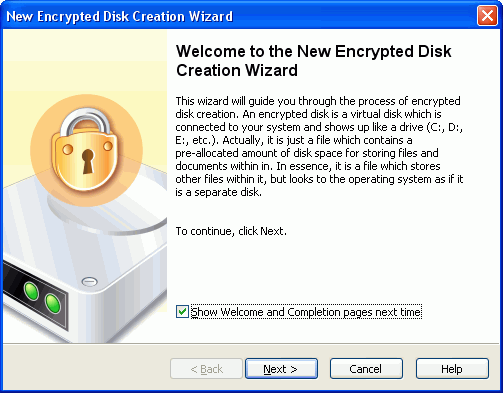 The New encrypted disk... message will appear when R-Crypto finishes creating the new encrypted disk.